Standing Jikokuten, 12th century, wood with pigments. In the hierarchy of the Buddhist pantheon, the celestial beings (Skt: deva; Jpn: ten-bu) are ranked beneath the enlightened buddhas (Jpn: butsu), the compassionate bodhisattvas (Jpn: bosatsu), and the wrathful wisdom kings (Jpn: myо̄о̄). They do not, however, fulfill a lesser role; in fact, it is their task to protect the Buddhist cosmos and its divine denizens, as well as the mortal creatures who remain in the cycle of rebirth. Some of the celestial beings belong to a subgrouping called dharmapala, literally “guardians of the teaching.” They ensure Buddhist practitioners do not stray from the teachings of the Buddha by intimidation and sometimes, if the need arises, by violence. Close adherence to and a deeper understanding of Buddhist practice may eventually bring the dharmapala under a devotee’s control. Within the dharmapala are the lokapala, or “guardians of the directions,” some of which were adapted from the Tibetan pre-Buddhist Bon tradition, while others, namely the guardians of the four directions, were carried over from Indian traditions. The Four Guardians, known in Japan as the shitennо̄ (Four Celestial Kings), were some of the earliest recognized deities on the archipelago following the introduction of Buddhism in the mid-sixth century. They were especially important to Prince Shotoku (574–622)—an early patron of the new religion and instrumental in its establishment in Japan—who commissioned the construction of Shitennо̄-ji (Temple of the Four Celestial Kings) following a resounding victory over the anti-Buddhism Mononobe clan. The shitennо̄, each assigned to protect a direction of the sacred mountain Meru (Skt: Sumeru; Jpn: Shumisen), are Tamonten (Skt: Vaisravana), guardian of the north; Jikokuten (Skt: Dhritarastra), guardian of the east; Zо̄chо̄ten (Skt: Virudhaka), guardian of the south; and Komо̄kuten (Skt: Virupaksa), guardian of the west. Nagarjuna (c. 150–c. 250), an Indian monk and patriarch of the esoteric Buddhist tradition, wrote in his glossary of Buddhist terminology, called the Dharma-samgraha, about the Four Celestial Kings. Whereas Vaisravana commands the yaksas (Jpn: yasha) and rakshasas (Jpn: rasetsu), Dhritarastra is the leader of the gandharvas (Jpn: kendatsuba), or heavenly musicians, and of the pisaca (Jpn: bishasha), or vampire demons. 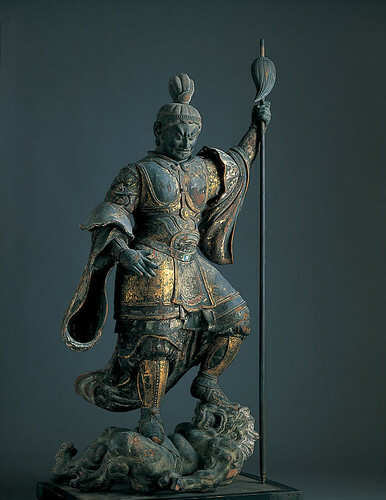 Sometimes depicted with a stringed instrument in hand, he resides on the eastern slope of Meru and there with his army fulfills his vow, made before the historical buddha Shakyamuni (Jpn: Shakamuni), to defend those who call the peak of Meru home. The stringed instrument he holds in two hands—though often substituted for a sword or three-pronged spear and a posture with one hand on his hip—is affiliated with the Buddhist concept of the Middle Way. If the strings are too tight or too loose, the tone will not be right and a song therefore unattainable; similarly, if a Buddhist adherent’s practice is too stringent or too relaxed, enlightenment will be forever out of reach. The Chinese concept of the four directional animals (Ch: si shou)—the dragon, the red bird, the tortoise, and the tiger—and their associated symbolic elements, seasons, and colors, was largely supplanted by the shitennо̄ in Japan. Jikokuten, an exemplar of the virtue of strength and therefore assigned specifically to the protection of the nation, is connected with the colors blue and white. His symbolic season is spring and his element is water. Jikokuten at Tо̄-ji, ninth century, wood. Jikokuten rarely, if ever, appears apart from the other members of the shitennо̄. Like his counterparts, Jikokuten is dressed in Chinese-style yoroi armor and wields weapons of war to fend off evil. His face is fearsome and intimidating to add to his wrathful demeanor, and he often tramples demons (Jpn: jyaki) beneath his feet. The guardian king of the east appears is multiple forms of art in Japan, including dedicatory art found in temples and house shrines. His likeness can be found with the other shitennо̄ in an Asuka period (538–710) tomb painting. He also appears in the outer section of the Taizо̄kai mandara (Mandala of the Womb World) and, among others, in the mandala of the Ten Realms. The earliest depiction of him in sculptural form, and which still exists today, can be found in the kondou building of Hо̄ryū-ji—it dates to the seventh century and is made of painted wood. Another beautifully dynamic sculpture, constructed from dry lacquer, is in the collection of Tо̄-ji, dating to the early Heian period (794–1185). In an uncommon triad, Jikokuten attends to Amida (Skt: Amitabha), ruler of the western paradise, with Zо̄chо̄ten.